PNB MetLife is one of the renowned private life insurance companies in the country. The company offers all kinds of policies including term plans, savings plans, pension plans, etc., for its customers. It also offers group life insurance policies for policyholders belonging to various groups and corporate companies. Among the diverse range of plans offered by the company, term plans occupy a significant position as they are the cheapest ones in the lineup. 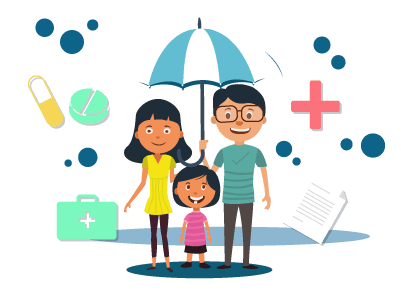 People who look for pure life insurance coverage opt for term insurance plans as they can get high-value life coverage at an affordable price. Buying a term insurance policy is one of the major financial decisions one has to encounter in their lifetime. The cost of a policy significantly influences the purchase decision of a customer. Insurance companies take various factors like age, income, marital status, health condition, smoking habits, location, etc., into consideration before setting the price for a specific policy. Considering the complex nature of this calculation, it will be hard for companies to provide individual price quotes to customers who are researching policies available in the market. This is where a premium calculator comes in handy. Customers can calculate the premium cost themselves and choose the best policy that meets their requirements. Click on the button ‘calculate premium’ located at the right side of the homepage. In the drop-down box, enter your gender, date of birth, smoking habits, location, annual income, email ID, and phone number. When you click on ‘submit’, you can find the premium amount for the policy you have chosen. Click on ‘tools’ from the homepage menu. In the drop-down menu, click on ‘premium calculator’. In the resulting page, enter all the required details like name, age, gender, smoking habits, monthly salary, outstanding liabilities, existing insurance covers, etc. The calculator will determine the coverage you need based on the details you have given. You will be given different options of the term plans available with the company. Once you have chosen the plan, you can get a price quote for the particular policy. Comparison of cost plays a major role in influencing the purchase decision of a specific policy. With a premium calculator, people can choose the right product and sum assured amount that fits within their budget. Another major advantage of using a calculator is time efficiency in determining the price. Potential customers can discover the price of various plans instantly without waiting for the insurer to come up with a price quote. With online premium calculators, customers can improve their knowledge about various insurance products in the market. They can check the prices of different products and know why a specific product is available for a low price. Calculating the cost of premium manually is a tedious task for a customer. The complex algorithm is simplified with a premium calculator and customers can know the prices of term plans instantly. PNB MetLife offers an online term plan by the name PNB MetLife Mera Term Plan. If you are thinking of buying this plan, you can use the premium calculator to determine the cost for your desired sum assured amount. By trying out different options, you can find the right coverage amount that fits within your budget. Once you have determined the amount, you can proceed with the application if you choose to buy the policy. You can provide your personal details and request a callback from the company.